Expected to be officially announced later this month, the HTC One mini 2 (aka HTC One M8 mini) appeared at the GCF today. Since the GCF (Global Certification Forum) is an official “independent certification scheme for mobile phones and wireless devices that are based on 3GPP standards”, the existence of the One mini 2 is now pretty much confirmed. 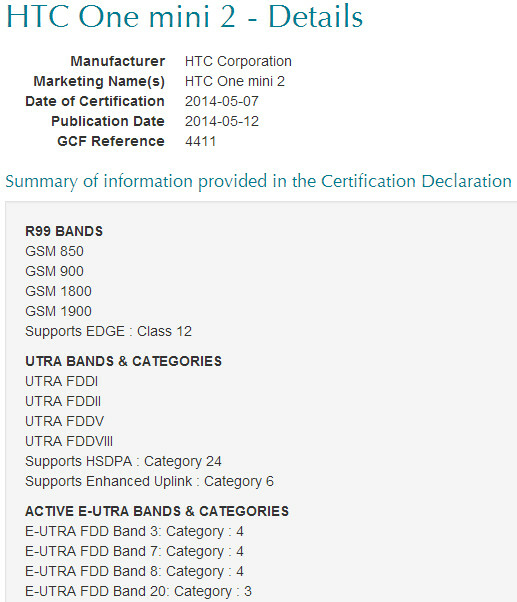 It seems that this particular One mini 2 that was certified by the GCF is the European model, as it comes with LTE bands mainly used in Europe (bands 3, 7, 8 and 20). However, that doesn’t mean the handset won’t have a US version. In fact, we already heard that Verizon may launch the new One mini at some point. long ago, we saw the One mini 2 in three color variants, and even in a hands-on photo. The new handset should be slightly larger than last year’s One mini, allegedly sporting a 4.5-inch 720p display. Other features should include a 13MP rear camera (no UltraPixel technology), quad-core Snapdragon 400 processor, 1GB of RAM, and 16GB of expandable internal memory. 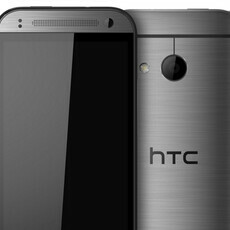 Like the 5-inch One M8, the HTC One mini 2 will run Android 4.4 KitKat with Sense 6.0 UI. Well, we're now waiting for HTC to finally announce the handset. 13 mp and htc? Sounds gimmicky! So the mini will have a better camera? :p not good marketing.. Assuming more megapixels automatically makes it better. Megapixels don't mean everything. The Titan 2 had a 16 MP camera, and it was terrible compared to the One. The Droid DNA and One X had 8 MP cameras, they captured slightly more detail than the One, but the One beat them in every other category. My Z1 Compact is far more powerful than this. Pretty good for a mid ranger. I am waiting for the M8 Prime with the bigger screen. As far as mini options go, this will be the best one available. Good job HTC. Now bring on the Prime. i think the prime is a silly idea. its a good way to dilute value of your regular m8 and communicate to your customers a lack of confidence in your original version. albeit you may want one, it's not a good idea to build long-term value in your brand. just sayin... make that 2gb ram and we might be in business.. i don't need all the torque from six core processors but i would definitley appreciate the RAM.... it depends on the support too. if the cm community picks this one up i might too. but there's no way i'm running stock. this is why HTC has been my favorite since the beginning. it's really too bad that Carriers are trying to lock down rooting... why? is 15B profits not enough? someday i really would like to see the numbers on this. carriers estimated $100,000 lost due to rooters teathering. they still pay for the data of course, just not the extra teathering package..... wow... much detrimental. such poor.